THE HOST After a 20-year career as an instructional designer/entrepreneur and college teacher, and three years of environmental sustainability leadership in her community, Jen Boudrie saw a clear need to connect people and resources and created the Massachusetts Green Career Conference which she facilitates with the support of an Advisory and On-SIte Conference Team. 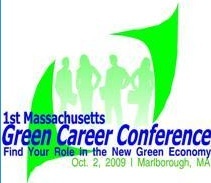 The first annual Massachusetts Green Career Conference was held 8am-noon, October 2, 2009 at the Holiday Inn in Marlborough, MA. It was a successful forum for experts and exhibitors who provided green career guidance for jobseekers, a forum for stakeholders (government, businesses, colleges, individuals), current news from business & industry experts, and networking opportunities. 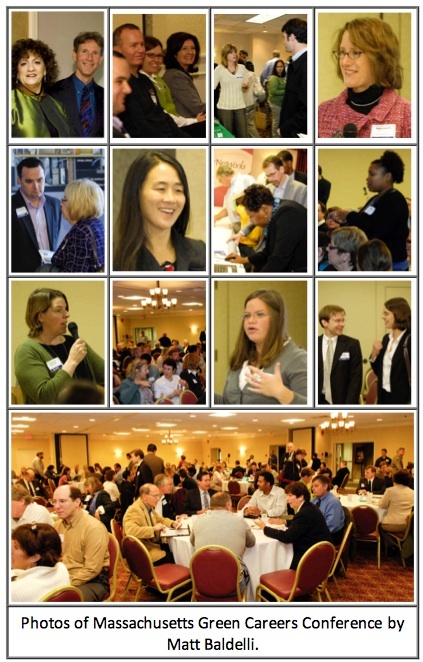 This conference attracted over 300 people and was sold out 5 days in advance. Kevin Doyle, an expert and author on the green economy and environmental careers and co-chair of the New England Clean Energy Council’s Workforce Development Group, has been tracking and analyzing the world of “green jobs” for more than twenty years. Coffee and tea were Fair Trade and organic. Breakfast items were purchased from a local Massachusetts bakery. The estimated 2.7 tons of C02 created by this event from car travel and electricity use was offset by a donation to www.LiveCooler.org to install energy efficient lighting in 7 low-income family homes in Massachusetts to save 4.7 tons of C02 and $2350 over five years. Ridesharing to this event was available through Viamerge.